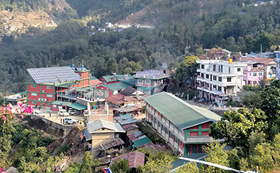 Established as a small clinic in 1962, Okhaldhunga Community Hospital now provides affordable, quality health care to people from surrounding villages who come seeking assistance. It is now a 50 bed hospital, with a Mothers' Waiting Home (for women who travel from distant areas to be near the hospital before their delivery), operating facilities and a busy Outpatients' Department. For more news, download the latest edition of Friends of Okhaldhunga here. To give to the Okhaldhunga Community Hospital Renovation Appeal, click here and follow the prompts. When you reach the panel that says "Please pass the following instructions to the charity" please enter Okhaldhunga Community Hospital Appeal. Building work is progressing apace at Okhaldhunga Community Hospital in Eastern Nepal. The following new buildings have been completed: Main Treatment Building, OPD, TB Ward, Maternal Waiting Home, Emergency Room, Laboratory, Canteen and some Staff Quarters. Click here to read detail.